This week, as part of the Inclusive Innovation series we announced this spring, we’re interviewing Teresa Condicion of Snapcart: a company that provides brands with valuable insights around offline shopping behavior. We chatted with the Co-Founder about building analytics company in Southeast Asia, the obstacles of being a woman in tech, and her secret weapons. When Teresa and her Co-Founder started Snapcart, all the statistics were not in her favor — she had a long corporate career (17 years in P&G), female, Asian and just became a new mom. Since 2005, she had the aspirations to build an analytics company (it was part of her mission statement that she had been writing yearly since she was 25). But even within P&G, she was always crazy about data analytics and innovation. Her favorite role was building new methods to measure ROI for the globe, in a more cost-efficient manner. Her last role was investigating the use of Big Data for research, which gave her the idea to crowdsource purchase data. Unlikely entrepreneur or not, it all worked well in the end. The timing was great: mobile phone penetration was growing exponentially in Southeast Asia — earlier and their idea may not have worked. She met her co-founders who were working on the same idea, and despite very different backgrounds, they clicked right away. Additionally, all the time spent in P&G taught her new skills about leadership, building great organizations, and learning about analytical excellence, which is now benefiting her as she navigates this stage of scaling up Snapcart across multiple countries. Teresa grew very frustrated with the data she was receiving from the current providers. “They were slow, manually collected door to door via surveys, among few thousand respondents. I’d wait 3 months to receive my shopper tracking data and spend half the month reconciling it with other data sources that were showing different conclusions,” she says. In 2014, she went on her (2nd) maternity leave and like most moms, she got stuck behind her mobile phone while breastfeeding and taking care of her baby for hours on end. During those 6 months, she spent all of her time learning about the technology that powered it and took courses on coding and machine learning. While her original plan was to get back to P&G and propose the idea, it soon became obvious that this was something she had to build on her own. Luckily, she met her co-founders and the rest, as they say, is history. Teresa is originally from the Philippines and now lives in Singapore. 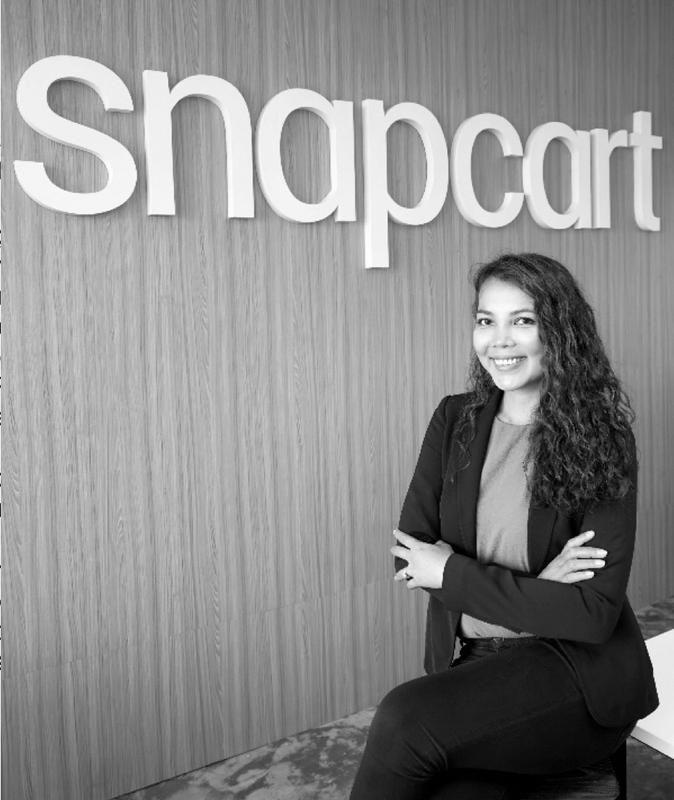 She works across Indonesia, Singapore, and Philippines (and now Brazil), where Snapcart now has several operations. “Each country has a varying level of startup ecosystem maturity, but in all of them, they are still relatively new, fast growing, and vibrant,” she explains. In Singapore, the government is providing immense support for entrepreneurs and is opening the country for technology companies in the region to thrive and succeed. Indonesia and Brazil have produced quite a few unicorns, and the Philippines is starting to become more developed and exciting, too. She recalls talking about machine learning and AI that they are building at Snapcart and she was told: ‘I hope you know what you’re talking about’. “I have heard before that as a female, you get recognized for what you have demonstrated rather than what is your potential. And I totally can relate to that.” But the 17-years-of-P&G and 10-years-in analytics badge definitely helped her. Also, she says, the other good thing about being an older entrepreneur — you become wise enough to not be so affected by these obstacles — she’s too busy hustling. As part of the Cannes Startup Academy, we’ve profiled each of the eight founders who were accepted into the week-long program. Stay tuned and follow us onTwitter as we continue to tell stories around Inclusive Innovation. Originally written by Liz David published in Medium.com on 17 July 2018 .